This 1280 x 800 projector is perfect for classrooms and meeting rooms, and if you are on a tight budget, this model is great option for you. It is not heavy on features, but it easily accomplishes the prime purpose of any presentation projector as it delivers a bright image on the screen for your audience to see what you need them to see. With a great 20,000:1 contrast ratio and a powerful 3200 lumens this projector brings widescreen WXGA resolution, large, and bright presentations with accurate, vibrant colors, and incredible image clarity. If will display all the subtle details in any presentations. It is ideal for use in medium size training rooms, conference rooms, houses of worship, and classrooms. White light output is the focus of this projector’s preset image modes, and this is exactly what most people want and need from a presentation projector. The Optoma W311’s brightness is rated at 3200 lumens maximum. Bright mode, of course, delivers the brightest picture, so color and contrast take a back seat here. You should consider Presentation mode if you need more color saturation and better contrast. This mode measures 1660 lumens, and has better saturation and shadow detail, plus a small blue tint which is adequate for computer-based content like text documents or Powerpoint slideshows. For content where color is vital, Movie mode measures 1276 lumens, and offers great saturation as well as the best contrast performance of any projector’s preset mode. If none of those preset modes suits your needs or appeals to you, there is also a User mode. Moreover, for those situations when you need less light, you can reduce brightness by 20 percent by switching the lamp to Eco mode. The black level on the projector is only so-so, yet this is usual on presentation projectors. If your priority is accurate color, run this projector in Movie mode as it gives reasonably accurate color and great overall image balance, as well as good saturation. The other image modes on the projector are a bit brighter regarding ANSI lumens, but give the impression of washed-out, dull color with poor saturation. 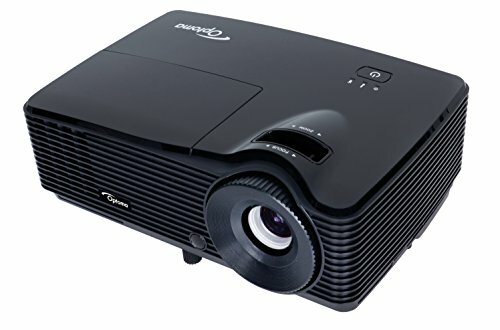 All this is quite standard for affordable presentation projectors. This projector doesn’t sport any onboard controls besides a power button, so it is completely dependent on the remote control. Moreover, the projector does not boast any VGA inputs at all, but it does include two HDMI ports. So, this projector isn’t a good choice for you if your classroom or workplace still utilizes analog sources. Also, another thing to consider is the appearance of rainbow artifacts which is usual for all DLP projectors utilizing a 2x-speed color wheel.